When shopping for a new above ground pool there are people who love round pools and others who prefer the looks of oval pools. But when shopping for an oval there are some important differences between models to consider. Because oval pools don’t distribute the weight of the water the same way as the round pools do, an additional support system is required to help bear the load. 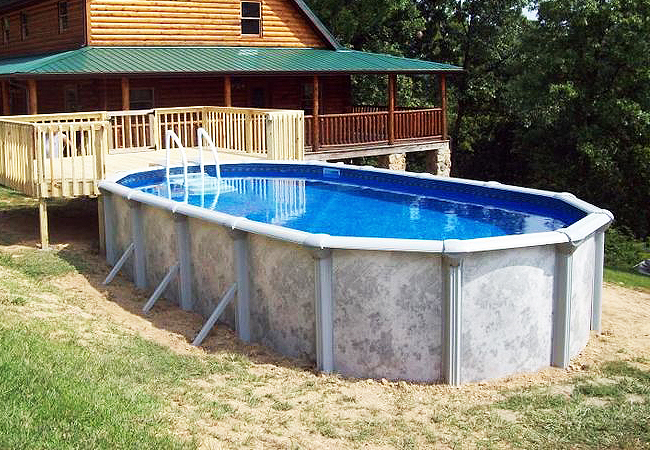 Below is a picture of the two basic types of buttress support systems used in oval above ground pools. The first image is the traditional buttress design or A-brace, and the second is the buttress-free or buttress-less type. As a child growing up in the 70’s-80’s everyone in the neighborhood who had an oval above ground swimming pool had the traditional buttress design because that’s all there was at the time. These pools had the big braces that stuck about three feet on each side on the pool and you had to be careful not to trip and fall over them when playing in the yard and they were also a pain to mow around when doing yard work each weekend. Even though there are many buttress free models on the market to day that eliminate the A frame buttress design, the traditional buttress pools do still have their advantages in certain circumstances. This type of support system is less expensive then the buttress free design saving hundreds of dollars off the purchase price. This can be a huge savings along but if you are building a deck around the pool or if you are sinking your swimming pool into the ground the braces won’t be seen anyway so why pay more for the buttress free design. Even though the difference in price can be significant between the two types I have seen no evidence that one design outlasts the other. Click here is view size selection and pricing of our recommendation for traditional buttress oval pool model. 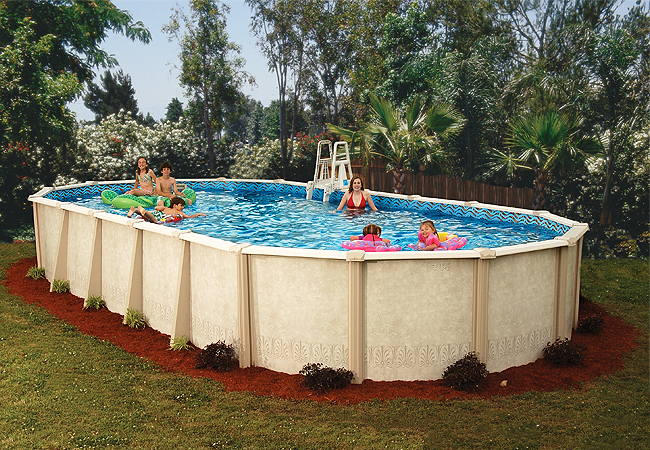 The buttress free oval pool design takes up less space in the yard because the side support system only sticks out about 2 feet instead of 3′ like the traditional buttress oval pools. But what most people notice is the lack of big angle braces. When no A frame braces are present the pool sides appear much more straight up and down like the round pool. This means nothing to trip over and much easier to work around. The slick smooth side looks of the buttress free pool models make them very popular with home owners. Aside from appearance, the buttress free design allows a larger pool to be placed in the same amount of space. This is because the overall footprint of the pool’s framework is narrower due to the shorter buttress supports, this means any same size buttress free pool will be about 2 feet narrower than it’s traditional buttress counterpart. The downside of swimming pools with this buttress design is price, they cost significantly more money because of the additional steel required for their framework. As I said before, I believe they all last about the same amount of time regardless of the side support system used.